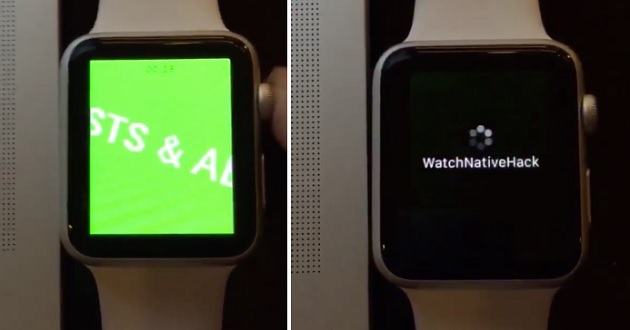 Famous iOS developers and hackers Saurik, Steve Troughton-Smith and Adam Bell have managed to hack watchOS 2 beta to run truly native applications on an Apple Watch. If you have been following watchOS 2 news lately then you would know that Apple has somewhat allowed developers to run native apps on the Watch, however it is not truly native as even though the logic code runs on the watch the access to UI is still not possible on the watchOS 2 itself. So frameworks such as the UIKit cannot be utilized to create custom user-interface on the Watch. However with this new hack the developers were able to create a fully interactive 3D object on the Apple Watch using Apple’s SceneKit framework. Even though the ScreenKit is used in the demo, this achievement proves that developers will be able to use any UI framework that works on iOS devices. This is not the first time Apple Watch has been hacked to run native applications as previously hacker Comex also demonstrated Safari browser running on an Apple Watch. The developers who worked together to achieve this feat have announced that they will release technical information about their hack once the watchOS is released in the fall.